If you do not know what a little library is, it is like a over large bird house, they can come in some pretty adorable a nd funky designs, it just depends on your hood. Well I was on my way to the grocery store and I noticed one in my hood. Excited party of one, now came the dilemma of deciding what book or two to add. I mean I could not be selfish and turn my whole hood into romance fiends…Right? The whole concept of the Little Library is to add a book for others to read and then you can take a book, the good ole honor system. I had to explain that to my nephew last night, but only twice. You see he wanted to take a book but I brought two so we were covered. In all fairness he was along for the ride he did not understand it until he saw it. The two books I added to the collection. 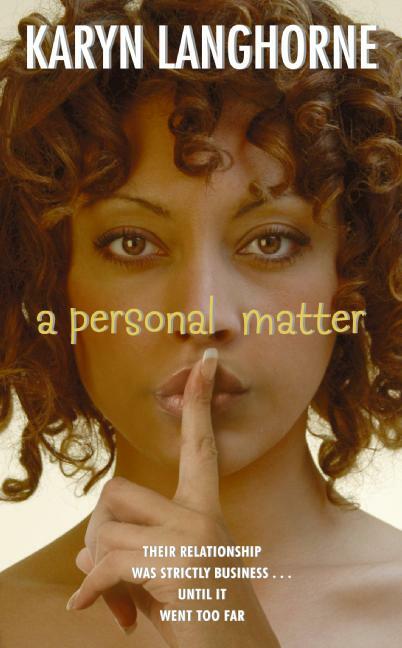 One A Personal Matter by Karyn Langhorne. I enjoyed this book it is a reread for me even though it is only told from the heroine’s point of view, but I really feel it will fit the neighborhood, which is a mix of college students, middle to lower income, elderly and very ethnic. (Check out my review). I also added a newer book Tangled (Tangled, 1) by Emma Chase. I have not read it but it is really hot right now and I see some good reviews on it. It is very shiny, and sometimes covers attract readers and I want to attract readers to the Little Library! Do you have a Little Library in your hood? What book would you add? I wrote a little note to include in A Personal Matter, I just wanted the person to know why I chose the book and why I love reading, I want a book pen pal! Drake cannot understand why Rachel ignores, avoids and all out runs from him. Women find him attractive yet Rachel goes out of her way to be polite but distant. Rachel finds Drake to be more than she can handle. After a relationship gone wrong in the city, she has resigned herself to a single life living with her father on her family’s ranch in Crest Hill. Drake knows what he wants, he has never been shy about it and will not let Rachel’s fear or her overprotective fathers shotgun stop him from claiming the woman he knows is meant to be his. Bookswagger Marcia: Three Crowns, swagger jacked, decent read. This was a cute read, I found it interesting how the author weaved in Rachel’s parents romantic history. Her father is white and her mother was AA and it was unheard of in their time, especially in the small community they reside in. Rachel and Drakes romance moved pretty darn fast. They knew of each, a product of growing up in the same small town and we are definitely getting the vibe Drake is ready to do what he has to do to make Rachel his after she avoids him for the second time. He is willing to go slow since she is the big V…Yes, I know annoying to some readers in romance land. Straight to the Swagger: It was alright. The heroine was extremely innocent. Did not know her own beauty and you hear about her overprotective father and his shotgun a lot…So here is another read that can be used for the reading drinking game. Every time you read shotgun. Throw one back for Bookswagger! Some may think Whit is a sucker in fact she knows they do but she cannot let an innocent baby be placed in child protective services. A product of foster care herself she knows the type or lack of safety some of the foster homes provide. She steps up to take care of her friends baby, a baby she helped welcome into the world and already love as her own, not knowing he comes with a father attached to a hate group. Bobby Jack has only one thought when he is released from prison. Not strengthening his hate group ties but finding his son and the mother of his child. He is not prepared to find his child being taking care of by a black woman. A woman belonging to a group he has always professed to hate and has the tats to prove it. The two bond over their love for one baby and find they have more in common than they thought, starting with their desire for one another. Bookswagger Marcia: Three Crowns, swagger jacked, decent read. This was a different read for me. I was not bothered by the language or the hate speech, the author did warn us and you hear worse in an episode of SVU. The author touched on some touchy subjects. The one line that stuck with me is things have gotten worse since President Obama was elected ( I paraphrased), to be frank I have heard that before. I felt like I was reading about the experience of two separate people who were searching for a way to survive the ordeals of everyday life. Two people who eventually connected and found they liked facing those ordeals together. The romance almost took a back seat, to me when they were actually getting together and building their relationship the book ended with the two talking on the phone. Either there is going to be a book two or this ending left a lot to be desired. Straight to the Swagger: Read for the experience, seeing two people from different backgrounds coming together. If you are reading for the romance alone you will probably be a little disappointed. But if there is a book two I am in!